Professional impact of rheumatoid arthritis: a cross sectional study among fifty patients. Objective: to evaluate professional impact of RA on the affected subjects. Materials and Methods: A trans-sectional study was conducted in the Rheumatology Service of University Hospital of Monastir, in Tunisia; between 1999 and 2013. Study population is represented by patients with the diagnosis of and selected according to inclusion and exclusion criteria. The severity of RA was evaluated through the Health Assessment Questionnaire (HAQ) and the capacity of work was assessed according to the Work ability index score (WAI). Results: Half of patients stopped definitively their professional activity because of their illness that occurred in the majority of cases at the first 5 years of evolution of the disease. Working leaving was found in 48 % of cases, invalidity in 28 % of cases, early retirement in 12 % of cases and the long-term sick leave in 12 % of cases. Predictors of work stoppages were the means of transport between the place of residence and workplace, the work sector, the professional category and to presence of coxopaty. Patients in professional activity had a mean score of WAI 28± 8.28, 80 % of them had a working capacity poor to moderate. Predictive factors of poor work ability were the type of profession, exposure to movements in hyper flexion, hyperextension of wrists and to repetitive gestures and a high HAQ score. Conclusions: Loss of work among patients with RA is a multifactorial and complex phenomenon involving socio-demographic, clinical and other parameters related to professional environment. Keys words: Arthritis Rheumatoid; Work Ability Index; Disability. Gibofsky A. Overview of epidemiology, pathophysiology, and diagnosis of rheumatoid arthritis. American journal of managed care 2012. 18 (13 Suppl): 295-302. 2. Pillon F, Michiels Y. Épidémiologie et physiopathologie de la polyarthrite rhumatoïde. Actualités Pharmaceutiques 2013; 52:1-2. 3. Filipovic I, Walker D, Forster F, et Curry AS. Quantifying the economic burden of productivity loss in rheumatoid arthritis. Rheumatology 2011;50 (6): 1083-90. 4. Gabriel S E et Michaud K. Epidemiological studies in incidence, prevalence, mortality, and comorbidity of the rheumatic diseases. Arthritis Research and therapy 2009; 11(3): 229. 5. Osiri M et Sattayasomboon Y. Prevalence and out-patient medical costs of comorbid conditions in patients with rheumatoid arthritis. Joint Bone Spine 2013; 80(6): 608-12. 6. Fautrel B et Gaujoux-Viala C. Medical and economic aspects of rheumatoid arthritis. Bull Acad Natl Med 2012; 196(7): 1295-305. 7. Her M. et Kavanaugh A. Critical analysis of economic tools and economic measurement applied to rheumatoid arthritis. Clin Exp Rheumatol 2012; 30(4): 107-11. 8. Radkiewicza P et Widerszal-Bazyl M. Psychometric Properties of Work Ability Index in the Light of Comparative Survey Study. International Congress Series 2005;1280: 304-9. 9.	van den Berg T I, Elders L A, De Zwart B C et Burdorf A. The effects of work-related and individual factors on the Work Ability Index: a systematic review. Occup Environ Med 2009; 66(4): 211-20. 10. Ilmarinen J. The Work Ability Index (WAI). Occupational Medicine 2007; 57: 160. ISNAD Kraiem, Aouatef Mahfoudh , Mahjoub, Malek , Chguirim, Mahbouba , Asma, Boussaid , Rassas, Ines , Amri, Charfeddine , Khalfallah, Taoufik . "Professional impact of rheumatoid arthritis: a cross sectional study among fifty patients.". 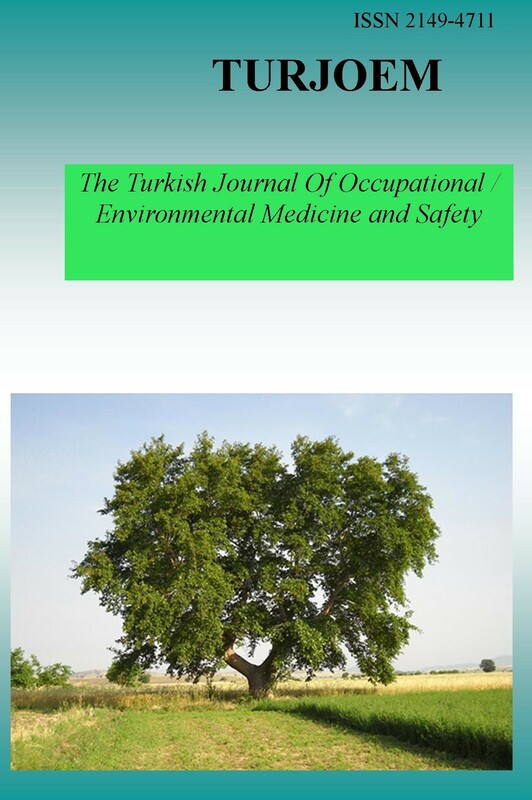 The Turkish Journal Of Occupational / Environmental Medicine and Safety 3 / 1 (February 2018): 8-8.